As the Great Depression dragged on through the months of 1933, the Northern Litchfield County Council continued to grow. With work hard to find for most men, boys no longer were able to hold part-time positions, or find summer jobs as farm hands. While this left more time for Scouting, it also made it more difficult to pay for a week of summer camp. Since the council was also strapped for cash, it only opened Workcoeman for four weeks in 1933. In view of the fact that the number of Scouts in the council had increased by fifty percent over 1929, each week ran at full capacity. While the council advertised the record weekly attendances, the reality was that the Dining Hall was crowded. As people adjusted to job sharing under the National Recovery Administration, citizens who held onto jobs found more time on their hands, some of which they spent as Scouters. The Northern Litchfield County Council received accolades for having the highest level of volunteer participation in New England. A possible side product of this increased volunteer time was a camp song, composed by Amy MacNeil. MacNeil was the mother of a Troop 23 Scout and the wife of the Troop’s Assistant Scoutmaster, both Harry MacNeil. The song, Camp Workcoeman, is sung to the tune of The Battle Hymn of the Republic. The words describe Workcoeman as a good old camp, already in its tenth season. MacNeil also chose to honor the camp’s standards, which may refer to flags, but more likely recall the high bar set for Workcoeman’s program. Give three cheers for old Workcoeman. Its fame goes marching on. Its name goes marching on. 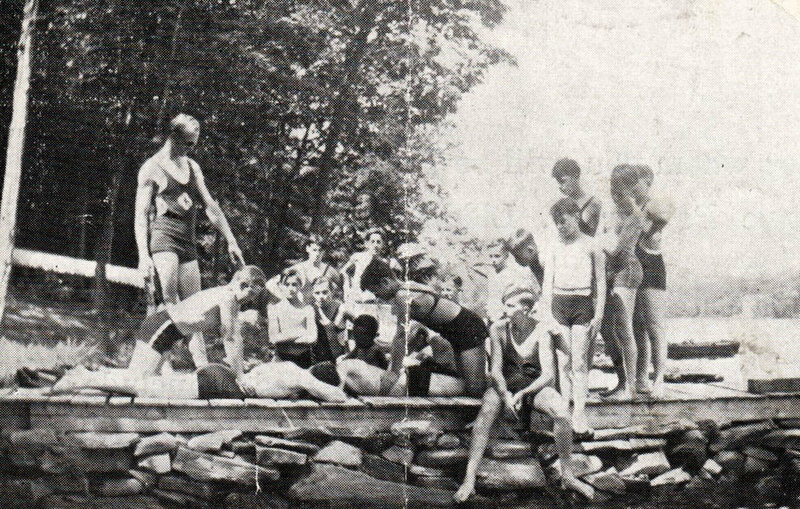 The image below shows Scouts on the camp dock during the 1930s, practicing the prone-pressure technique of artificial respiration.